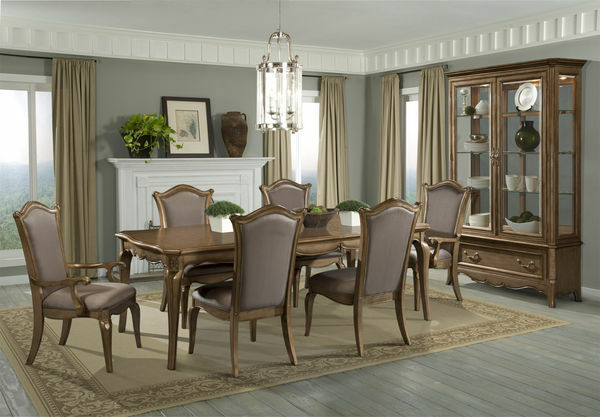 Modern elegance takes form in the Chambord Collection. 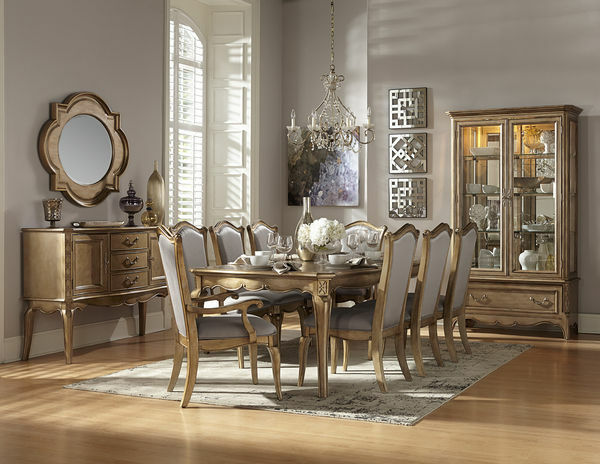 Immediately catching your eye is the striking champagne gold finish; an opulent mix of silver and gold hues; elegantly accented by the faux silk fabric and gold brushed hardware that is featured on select pieces of the collection. The serpentine-fronted table; china; and server are adorned with canted pilasters featuring overlay fretwork; scalloped bases and delicately splayed cabriole legs. Further lending to the lavish look of the collection is the faux silk back and seat of the coordinating chair. The server features drawer and door storage as well as an elegant quatrefoil hanging mirror. Completing the look of the collection is the graceful china. With mirrored backing; light feature; glass display shelving; and drawer storage; your dining room will be the talk of the dinner party.